The Integrated Management of Childhood Illness (IMCI) programme helps improve child care practices by involving communities at the household level in all efforts to reduce preventable childhood diseases, especially in children less than 5 years of age. Integrated Management of Childhood Illnesses (IMCI) is a strategy developed by the World Health Organisation's (WHO) Division of Child Health and Development and UNICEF for the care of children at first-level health facilities. It’s been introduced in more than 30 countries around the world to address morbidity and mortality in children under 5 years. Sick children often arrive at primary health care facilities with a number of medical related issues and have to be managed in an integrated manner at home and at the clinic. This is why the strategy focuses on the child as a whole, instead of on a single disease or medical condition. malaria (found only in Kwazulu/Natal Mpumalanga and the Northern Province). Primary health care staff are trained to identify children who have these illnesses. Sick children are assessed according to their symptoms and signs. Treatment is given if necessary, and as the caregiver or parent you’ll be counselled and advised on the follow-up care for your child. Severely ill children are urgently referred to hospital. 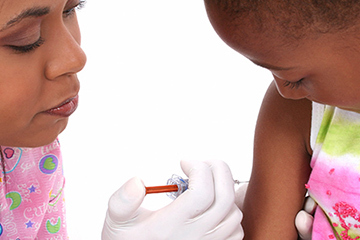 Moderately ill children get specific treatment at primary health care level and at home. Those that are mildly are given supportive therapy and counselling. If you’re a first-time visitor to a health facility, you’ll be asked to fill out a form and a folder will be opened. your child's Road to Health Booklet. Midwife Obstetric Units or primary health care clinics and centres offer integrated management of childhood illnesses. If you or your child is referred up the line, you’ll be sent to an urban or rural regional hospital, or a tertiary hospital. Please contact your nearest Clinic for more information. Services are free of charge at primary health care facilities.